London - It was a day full of drama for Team SA in the Olympic Games on Thursday after the men's 4x400m relay team were given an automatic berth in the finals and kayak specialist Bridgitte Hartley won bronze medal in her event. The 4x400m relay team failed to complete their heat after Ofentse Mogawane tripped during the second leg of the relay, leaving Oscar Pistorius stranded as he waited to take the baton. Shaun de Jager ran the first leg and was in fifth position when he exchanged the baton with Mogawane but when Kenya's Vincent Mumo Kilu cut in front of him, the South African stepped on his opponent's heel and both athletes fell. After looking at video footage, the South Africans appealed and Kilu was found to have caused an obstruction. "The Kenyan athlete committed an obstruction which is in rule number 163.2 of the IAAF, so we appealed, based on that rule," the team's manager Hezekiel Sepeng said. 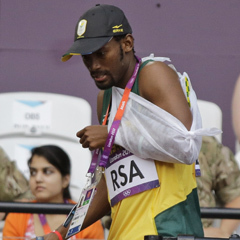 According to IAAF rules, the SA team were reinstated and given an opportunity to run as the ninth team in the final. Earlier, Hartley won South Africa's first bronze medal at the Olympics, in the women's kayak single K1 500m race at Eton Dorney. Hartley crossed the line in one minute, 52.923 seconds (1:52.923). The gold medal went to Danuta Kozak of Hungary who finished in 1:51.456, followed a second later by Ukrainian Inna Osypenko-Radomska in 1:52.685. South Africa now boast three gold medals, one silver and one bronze, lying in 20th position on the medals table. More drama was to follow when Jessica Roux of South Africa dropped out of the women's 10km open water swim on the fourth of six laps. She had fallen well off the pace in the gruelling race at the Serpentine, a lake in Hyde Park and then swam to the side to hold on to one of the rescue boats. Roux was hoisted onto a safety raft and taken back to shore. She was then carted off in a wheelchair. In the decathlon, South Africa's Willem Coertzen won his 100m hurdles heat, in a personal best time of 14.15 seconds. It moved him up into the tenth spot in the overall standings but he still has three events to complete - the pole vault, javelin and 1500m.